Located on the Noosa headland, Noosa National Park is home to a rugged coastline scattered with coves and sheltered beaches. The grass lands, scrubland, open forest, rainforest and wallum heads are easily accessed via a series of walking tracks and the park entrance is just metres from Noosa's town centre. Often known as the Great Sandy National Park, Cooloola National Park offers 56,000 hectares of beaches, sand dunes, mangroves, rainforests, woodlands and lakes. The park is Queensland southern coast's largest tract of natural land and is also home to the world's largest intact sand dune system as well as scenic drives, swimming spots, boating and fishing. 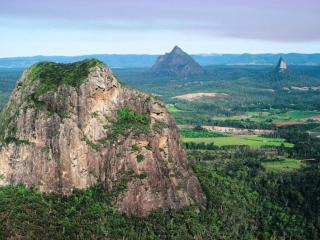 The Glass House Mountains National Park is home to 7 out of 13 distinctive volcanic mountains that jut out of the low plains to Caloundra's south. 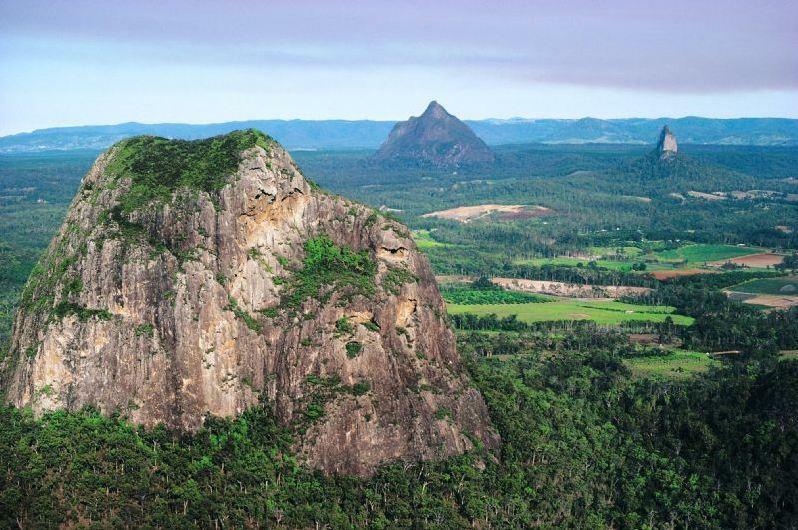 The park is slightly smaller in size and is quite a sensitive ecosystem therefore camping is not permitted however visitors can enjoy picnic spots, rock climbing and bushwalking. Named after the Aboriginal word for 'rushing waters', Kondalilla National Park offers 327 hectares home to the flowing waters of Skene Creek which cascade over the 90m Kondalilla Falls. The crystal pools at the bottom of the falls are particularly popular swimming spots and are a great place to relax in summer. One of the Sunshine Coast's most popular spots for bird watching, picnics and bush walking, the 26 hectares of rainforest of Mapleton Falls National Park protect the remains of the wet eucalypt forests which used to cover the Blackhall Range. Flowing through the picnic area, Pencil Creek cascades 120m over an escarpment into the Falls of the valley below, creating the park's main attraction.